The BMW 440i, whether in Coupe, Convertible or Gran Coupe guise, is still a perfect sleeper, despite being a bit old already. This particular model isn’t all that old per say as it was introduced in 2016 but the platform it rides on is getting a bit long in the tooth, especially inside when compared to newcomers. One such newcomer is the new Audi A5 which does have a brand new platform, new interior and new exterior design. Even under the hood the new A5 is getting a couple of new engines, especially in the top of the range models – S5 and RS5. 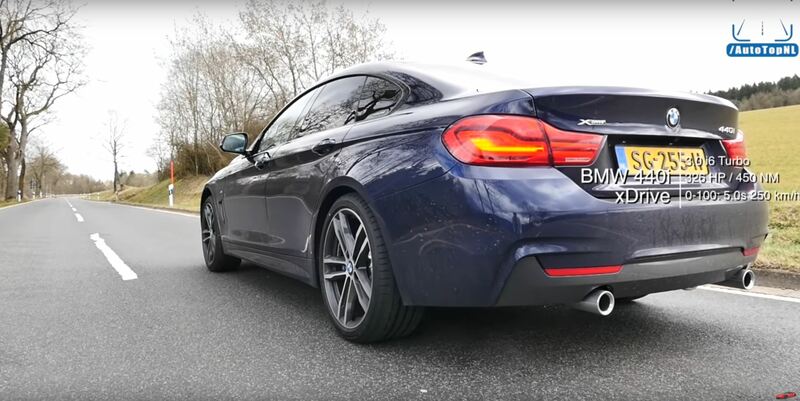 In the video below we get to see the Sportback model taking on its natural rival, the BMW 4 Series Gran Coupe. Both cars are not for the weak, featuring more power than you need on a daily basis and they really are comparable, even though the BMW is less special than its Audi rival. The 440i Gran Coupe is not oozing out performance if you just look at it. That’s especially true if you spec it with anything other than the M Sport package. At the same time that could be a good thing. In standard guise the car comes with 322 HP and 332 lb-ft (450 Nm) of torque but we all know the B58 has a lot more potential. Even so, in standard guise, the car is FAST off the line, doing the benchmark 0-62 mph sprint in 5 seconds flat when fitted with xDrive. The S5 on the other hand, comes with a 3-liter V6 good for some 350 HP and 500 Nm (369 lb-ft) of torque. It has all-wheel drive as standard thanks to its quattro system and will do the same benchmark speed in 4.7 seconds. Faster then but how big is the difference in real life? Well, the video below should provide some insight.